Why Is Structured Cabling So Important? What is this hype about Structured Cabling? Isn’t the term thrown around a little too often in the world of cabling? The truth is, the structured cabling is so special because of its comprehensive network cabling system that is common for both the data and voice. 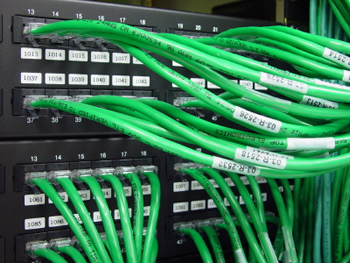 For example, the same structured cabling network can be used as a telephone system within the organization as well as a computer network. In most basic terms, the structured cabling which is fundamentally the data and voice network can be used as a Local Area Network (LAN) within a company, connecting the devices like the computers, photocopiers, printers etc, at the same time integrating the phones, surveillance cameras into the network, essentially making it device independent. It makes more sense to say that the role of structured cabling in a company is that of a backbone to a human body. We at VRS Tech provide structured cabling system in Dubai for organizations, following the local codes and practices making it a versatile, standardized network. Based on these requirements, the technician designs, plans, and executes the structured cabling installations following the local guidelines pertaining to the country, which are more or less standard. We at VRS Tech have expert technicians onboard, who are well-versed with the process, coming up with the best, structured cabling system in Dubai. A sturdy structured cabling network offers longevity and a tremendous amount of flexibility while making moves, additions or changes. Hence, it is ideal to make an educated choice while picking the right structured cabling company for your organization. 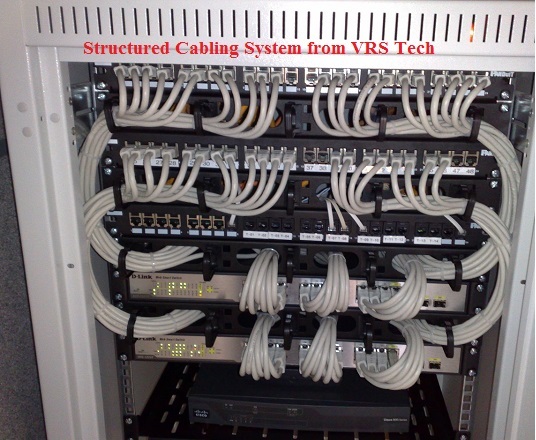 Contact VRS Tech at +971 56 7029840; for more information on Structured Cabling Systems. For any company today, there is a growing need for IT basics to expand its business but arriving at the right solution can show the desired change. Plus, to tell their story to the world around and enhance their growth, businesses need a proper communication. Telecommunications do the right job. A proper strategy applied can make telecommunications effective, which is the structured cabling system. What is structured cabling system? Structured cabling forms the basis of a business through its integrated approach in connecting data and voice systems. It supports your local area network (LAN) which in turn supports telecommunications like making calls, sending e-mails, sharing files or any kind of data transfer. With its wider networks, it can help a business improve with greater productivity. To monitor and manage the data center cabling, not many but the minimum staff is required. Changes or moves can be dealt faster and more efficiently with minimum downtime. Integration of data, voice and video reduces the burden of updating and ultimately lowers the costs of maintenance. Moves or changes can be made within the system easily saving time and money. Structured cabling comes with a high bandwidth that any applications in the future could be included into the system with little interruption to the system. Finally, you do not have to worry about the system getting outdated in the future. With structured cabling, your system’s large infrastructure can adapt with the telecommunication needs of the firm. Traditional wiring systems are made of complex wiring but the structured cabling unites the cabling system into a single unit transferring the data into varied formats. Moreover, it accommodates any new upgrades or changes efficiently making it flexible to move to new locations. To conclude, structured cabling system forms the pillar to your business by serving the telecommunication needs of the company. It organizes your entire IT network in a simplified manner as opposed to the traditional telecommunication system. If you want your company to be more organized and perform better, structured cabling system can be the very key to it. Are you looking for the right company to install the structured cabling system to support your IT network by satisfying the telecommunication needs? Then it is a worthwhile gesture. We at VRS Tech in Dubai consider ourselves to be a reliable team in providing the right assistance in installing structured cabling system with utmost care and expertise. Choosing Right Cabling Method – Structured Cabling or Point to Point Cabling? For any business firm, IT infrastructure is an inherent aspect and both the cabling and method of cabling decides the performance of the network. While choosing the cabling method, the present IT requirements and that of the future need a clear vision. The data, voice and video communication needs are growing largely day by day that the point to point cabling system might not meet the demands. And here is where there comes a well-fitting answer for a cabling method to be best suitable to your infrastructure needs. What does the point to point system do? As far as one can see, many of the IT firms have been used to the point to point cabling system for many years, but some years later, there has been a high rise in the data demands. To elucidate further, with the high increase in the number of computing needs, it is becoming hard for the traditional cabling method to make moves or changes with the flexibility for today’s needs. What use would it be if the cabling is incapacitated for your communication needs? Plus, the traditional or point to point cabling connects one server to another or one switch to the other, which at the end becomes a big jungle of wires. Why is structured cabling a feasible cabling method for the IT infrastructure? The structured cabling system is an integration of cables, equipment and management tools to enable telecommunications or say data, voice and video communications to take place with flexibility so moves, changes are made easily and continuously through the distribution areas of the structured cabling system. This is more of a standardized way of connecting switches to servers, servers to switches and switches to switches. Due to its organized characteristics, it is easy to understand the connections and make amendments in the future too. The financial burden having to invest on the future expansion of your IT infrastructure reduces as well. To sort out the better cabling method for your expanding business, the structured cabling can be apt. It can equip high amounts of data flow and increase the business productivity. VRS Tech is well established for designing and organizing premium structured cabling equipment for your company with our knowledgeable engineers planning it the fitting way for your firm’s IT infrastructure. Having a clear vision of your business will lead you to success. IT infrastructure, the lifeblood of your business is what is your hidden treasure and so shine your IT infrastructure and see the change. Whenever your firm needs the cabling system, you could choose to derive the edge with the structured cabling installation we have to offer. Never hesitate to call VRS Tech at +971 56 7029840and we will examine the site, plan and implement it right for you. In today’s trend, the strength of the organization has always been attributed towards their internal and the external communication mechanism which is ardently being provided by the built-in structured cabling system. In fact, it is the most apparent fact that the structured cabling system has been able to seamlessly provide the longest life cycle and in turn, completely metamorphoses the seamless network connectivity within the premises thereby making it very robust. Anecdote: The structured cabling system incorporates within it the vast cable networks such as the CAT 5, CAR 5e, CAT 6, UTP and the fiber optics. Local Area Network (LAN), which predominantly connects the entire terminal together. LAN to the internet service provider (ISP) which connects the LAN to the internet through a firewall system. The structured cabling system has been able to render the ardent connecting tool in an enterprise, as it brings about the network connecting tool which enables the client-server architecture for an efficient network setup. The architecture in specific has been able to bring about the multiple workstations which deliver the seamless data connectivity to the central server in a LAN. Anecdote: The client-server architecture has been the most successful model to date as it governs the seamless network connectivity, which is able to accommodate the service and the requests delivered through a network. The voice network connectivity has been found to be the most economical way to communicate with the multiple branches of the company. Its been a viable choice for more companies to adopt voice as a network carrier as it renders the uninterrupted service for the companies. The network connectivity to the multiple workstations has been a core component of structured cabling systems has undergone a massive transition in the recent past. This network connectivity has been able to accommodate both the data and voice through them, thereby becoming an essential carrier to support the VoIP (Voice over IP) through specifically designed VoIP phones, which works purely on the basis of IP (Internet Protocol). VRS Tech has been in the industry for nearly a decade and has persistently been very vigilant towards bringing about the latest trends in the networking and constantly being able to implement them to the multiple companies in the landscape. In the event that you are looking out for the structured cabling system and earnestly looking forward to align a network system in your premises, please approach us at VRS Tech and call us at +971 56 7029840 so that our support team could get in touch with your objectives. Please visit our official website at http://www.vrstech.com for more information.